Personally, I don’t think tomato soup needs tarting up, I really like it. Who nowadays, however, does make tomato soup from scratch or even dreams of ordering it in the unlikely situation of a restaurant listing it on its menu? It would strike one as being so passé, correct?, so gastronomically over and done with. Makes for depressing reading all of this. So much in contrast to the soup’s cheery bright red colour. I don’t suppose the hue of this soup played any prompting role in Andy Warhol’s painting of Campbell soup tins/cans in 1962? Head scratching doubt, probably not. “While visiting the Pittsburgh-born provocateur in the midst of Campbell’s Soup Cans’ production, art dealer Irving Blum was so impressed that he offered Warhol a show at the Ferus Gallery in Los Angeles. … Not only was the Ferus Gallery show Warhol’s first solo exhibition of pop paintings, it was also the first time Pop art had been displayed on the West Coast. No matter what the response was, this was a history-making event” (http://mentalfloss.com/article/71814/16-things-you-might-not-know-about-andy-warhols-campbells-soup-cans). History in the making and tins of soup, hey. Whatever else can be discarded from the descriptives of tomato soup, artistic primacy and fame now cannot. We can definitely say that, thanks to Warhol, tomato soup is ‘historic’ in some way. So why is it that it has become a rarity and most likely not even heard of by people under fifty years of age? I do remember tomato soup at the dinner table when growing up abroad but not at home in Italy – home being chez my Nonna, my Italian grandmother after whom I was named. As your average Italian home cook still abiding by the only cuisine she knew, i.e. regional food, my Nonna who was from Frascati never made the Tuscan Pappa al Pomodoro (which is a thick tomato soup mopping up a lot of dry bread). I had heard of “pappa al pomodoro” by the time I was eight only because the singer and actress Rita Pavone sang a song about it in a children’s TV series based on a book called The “Diary of Gian Burrasca” (translation: Johnny Tempest), featuring the scrapes and adventures of the exuberant/naughty boy Giannino Stoppani as he fought against the rules of the grown ups and the dickensian system of a boarding school. Well, this Johnny Tempest’s song said that a pappa al pomodoro was worth fighting a revolution over but it didn’t sound very enticing to me, I have to say. Click on the photo to activate the video. The first time I did get to eat a pappa al pomodoro, I smiled inwardly remembering how much I had loved that TV programme. For the record, much as I liked the taste of my first pappa al pomodoro, I can’t say I was blown away by it. It was nice but nothing to write home about. I did instead have an Aha! moment with the version I got to eat last month, in the countryside in Tuscany, and indeed I think I shall write a post about it, it was that good. Back to tomato soup. While I continue to this day to love Heinz baked beans on toast, I don’t remember ever buying a tin of any soup, it just didn’t seem ‘right’ to me, even back in the day. We didn’t ‘do’ tins in our Italian home, the only ones I spotted were those containing plain plum tomatoes. Commercially produced tomato soup used to be available in a dry version too, in packets. All one had to do was pour boiling hot water over the mixture and wait for it to rehydrate, even in a large mug. This was quite a staple of mine during my last year at boarding school. I’d add some cubes of cheddar to it and hey presto! my hunger pangs were curbed. I suppose I grew up thinking that tomato soup was somehow French or English in origin. Witness my surprise then when I found out that the Italian chef, gastronome and food writer Ada Boni included Cream of Tomato soup in her now legendary cookery book “The Talisman of Happiness” published in 1928. I found out via my next door neighbour Rossella, who also loves to cook, only a few years ago, who pronounced it delectable. More eyebrow raising when I discovered that some béchamel was included in her (i.e. Ada Boni’s) recipe. I had never had it served like that before. I ventured to make it and it was fine, very nice indeed. As the authors Simon Hopkinson and Lindsey Bareham comment in their book “The Prawn Cocktail Years”, “It is a curious thing that when you go to the bother of making a proper home-made tomato soup with very ripe tomatoes (essential), fresh herbs, decent home-made stock and cream, you end up with a soup that looks identical to and has an almost interchangeable consistency with what is very probably the world’s most popular canned soup: Heinz Cream of Tomato. The taste, however, is quite different.” Their version is similar to Ada Boni’s, except for the addition of garlic and whipping cream. Ada Boni eschewed any kind of stock, too, and added a bayleaf in the process, as well as parmesan at the very end. All this to say that it is high time we resuscitated the popularity of tomato soup. It can be served with buttery croutons, or cubes of mozzarella, or grated parmesan. Or, it can be served as a main course when paired with cod. Talk about tarting it up! My friend Liz made this recipe for us a week ago and I found it so delicious that I nearly lost sleep over it (not really, but I did send her a congratulatory whatsapp just before crashing at almost 1 a.m. and that’s after having imbibed a gals-night quota of fermented grape juice, if you catch my drift). The long and the short of it is that I just had to have a go at replicating last night. And here is what I did. There is a secret ingredient: a vanilla pod. So what you see in the above photo is a biggish saucepan containing lots of olive oil (extra virgin), 1 vanilla pod and 1 clove of garlic, slightly smashed. These were the freshest tomatoes I could find. I cut them in half and showered plenty of salt over them. The salt tames their acidic content as well as bringing out the best in terms of taste. I then placed them in the saucepan and turned the heat on. I let them cook with the lid on for 45 minutes, checking up on them now and then. This is what they looked like 45 minutes later. I removed the lid and let them cook for another 15 minutes, again over a fairly low heat. So, cooking time all in all about 1 hour. Set aside for now. This is the cod I had bought from my fishmonger’s that morning. Enough for two to three servings. I removed the skin myself. I placed the pieces of cod in an earthenware/terracotta pot and poured enough olive oil inside to cover them. I also added a few pepper corns. Yes, an awful lot of olive oil – enough for them to be able to swim in it. The olive oil, by the way, is Quattrociocchi’s extra virgin. Definitely one of my favourites. It’s from near the town of Alatri, in Lazio and has won countless prizes in competitions all over the world. I had turned the fan oven on at 180°C and placed the pot in it to cook … until it was ready, which took around 20 minutes. Now, this is where I differed from Liz. She told me she had baked her cod at about 90°C, half the heat I was dealing with. The reason I took this short cut was that … it was getting really late and I had two hungry people looking forward to their dinner. Liz’s cod took about an hour to cook if I remember correctly. While my cod was baking, I got out my trusty Italian style food mill. I removed the garlic and the vanilla pod from the cooked tomatoes. The vanilla had swelled up. I processed the tomatoes and what you see above is what got thrown away: the seeds and the skins. And this is what came through: a luscious, silky cream of tomato. Tasting pretty good already. It is amazing what the vanilla can do! You can’t actually taste a vanilla flavour as such and yet it confers a je ne sais quoi to the tomatoes that brings on a happy mood. Liz had used the olives from Liguria known as Taggiasca that cost an arm and a leg and are worth it because they are so wonderful. I didn’t have any so made do with a more humble black olive. I peeled the olives off their pip or stone or whatever you call that thing that can crack a tooth. Liz had fried her olives in some olive oil. I went crazy and using a small saucepan, sautéed some extra garlic, a teensy amount of red chilli, roughly torn basil leaves and the bits of olive. Only for the briefest of sautéing time. I poured the oil through a sieve and set aside. I put the cream of tomato back onto a source of heat, tasted, and then added a tiny amount of salt that it definitely needed (but no sugar hey, the vanilla saw to that – plus the tomatoes were pretty good stuff). The cod came out of the oven sizzling as you could see in the video. I got so excited at this point. I removed the cod from the oil. I poured the oil I had filtered into the soup, as well as the olive bits, I added fresh basil. I plated up and served. It as not as fine as Liz’s insuperable and for me Proustiaan first taste of this recipe but it was jolly good, even if I say so myself. Mmmmm … I’m wanting some more even now, looking at the photos. Fortunately for me and my risk-taking decision to use a much higher heat, the cod turned out to cook to a beautiful consistency. One final comment … these photos are of the recipe seconds before the soup got eaten so my concession to aesthetic presentation took a bit of a back seat. I revel at the photos I see on instagram and other food blogs and I really do admire the fine photography of the bloggers in question. I can’t keep up I’m afraid. What you see in my photos is what real food looks like in a real home with plenty of hungry people silently, or not as the case may be, telling you to stop the faffing about with the iphone camera now, and can we please sit down and eat. P.S. In case you are wondering about what happend to the olive oil the cod got cooked in. I filtered it and am going to be frying some veggies in batter with it tonight. Waste not, want not. About five years ago, I wrote a post about a salad soup (https://myhomefoodthatsamore.wordpress.com/2012/02/29/soup-series-salad-soup/) which is just the sort of thing one craves when the temperatures are cold or gloomy. At the time, I was very surprised to come across the inclusion of salad(s) in a soup but now of course I think it’s ‘normal’. It’s also very easy to make which never hurts. A few months ago, I found out that salad can also be cooked and served as a side dish. 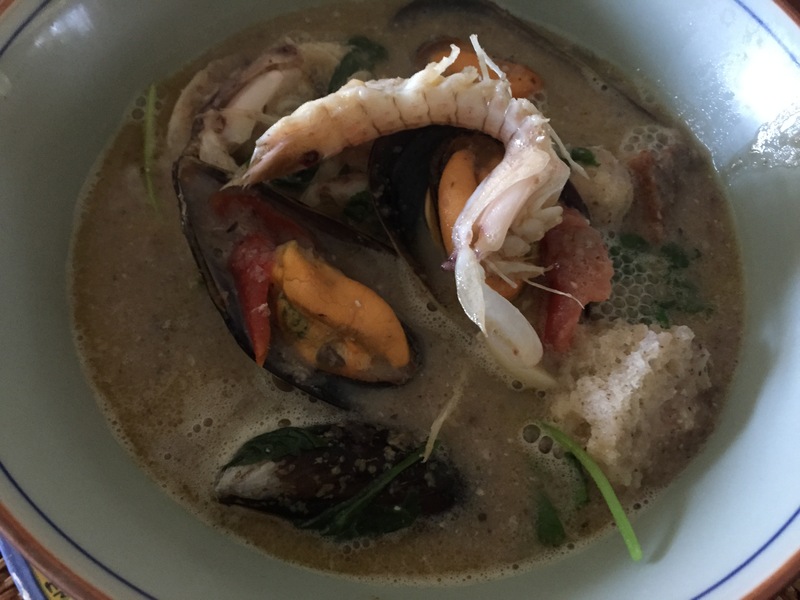 I’ll say straight away that though this might not be something I shall be clamouring for any time in the near future (especially now that Summer is about to explode), it did taste perfectly nice. I think it would make an excellent go-to recipe for when we are tormented by the sight of unused, somewhat sad-looking salad languoring in our fridges. Bonus: we enjoy a nice side dish AND get to feel virtuous because we ‘dispose’ of the salad in a fitting manner, avoiding food waste. The lettuce needs to be simmered in salted water for about three to four minutes, then drained and rinsed under running cold water. Squeeze gently so as to remove as much water as possible. Use some olive oil, butter and anchovy fillets as a sauce with which to coat and sauté the salad for a few minutes and then season with salt and pepper. The anchovy melts in the butter and olive oil and so leaves no strong aftertaste. Arguably, mine was not at all a sad looking salad. It was lovely and fresh. Do sprinkle some salt over the salad … and white pepper might be nice too. Maybe add a few olives? capers even? Grated cheese? Raisins? Pine nuts? Clear soup, that’s what we are talking about. Something frightfully old fashioned. I have only heard about it in books or films or TV series like Poirot or other Agatha Christie storylines. I thought I’d give it a go. 500 finely minced/ground beef (a cheap cut), 1 carrot, 1 onion, 1 celery stick, a few cloves, 1 bayleaf, 1 egg white. Place all the ingredients in your pot and add cold water – about 1 litre or just over depending on how ‘strong’ you want it. You can just about make out the bayleaf up at the top there. This is the egg yolk that gets left behind; do NOT put it in the stock. The egg white serves to ‘clarify’ the soup. This is a photo to show the egg yolk in the soupd but it’s not very easy to spot. What I have spotted, instead, is a celery leaf – and that is a major no-no when making stock/broth. Rule of thumb says no leaves except bay leaf. Now that I am writing this post, I remember what happened. I didn’t have any celery in the fridge and these measely leaves were all I had. Use a whisk or other utensil to shake things up a bit, to unloosen the minced beef. Turn the heat on and give it a good stir. And I mean stir! Stir energetically for a few seconds. Then, let it be, let it simmer over a very low heat for about 40 minutes. And this is what it looks like. See how ‘clear’ the stock is? Drain the soup-making elements. I would love to say one could make something of the meat that is left behind … but basically all the taste has been boiled out of it. So … be kind and give it your dog. And now you are ready to serve. Taste it first, in case it needs more salt. Who says old-fashioned can’t be exquisite? Please note: consommé is to be drunk straight out of its cup, no spoon soup to be used. Try drinking a glass of sherry with this, and proceed with wine for the rest of the meal. P.S. I actually did not serve the consommé straight away. I let the consommé cool down and refrigerated to use the next day. When it came out of the fridge it was a bit like jelly. Nor was the liquid clear any longer – and I was mortified. No worries: Once the consommé got heated up again, it regained its former glory in look and feel and tasted delicious. Friend Claire from New York makes regular visits to help brother George run their Casale, a beautiful country house at the foot of Monte Porzio Catone, with breathtaking views of the Roman countryside and the Tiburtini, Lucretilli and Prenestini mountain chain. The estate has vineyards and olive groves and is built over an ancient Roman Villa (take a look at their website for more eye-brow raising details: www.casalesonnino.com ). If you think running a normal house is hard work (as I do), you can imagine how much more complicated running a rental home can be, the work is never ‘done’, there is always some Damocles-sword repair work requiring sensitive attention (you wouldn’t believe how often a tractor can break down), appliances needing renewal or furnishings begging for refreshment; come October, freshly picked olives are rushed to the mill (and the milling can go on till midnight!) to make their award-winning olive oil. Claire and George go to great lengths to make sure their guests are not only comfortable but cosseted too. Rome is the Eternal City and nothing can compare with it, that’s a given. Having said this, however, the proximity to Rome means that their Casale can offer the discerning tourist a very different ‘take’ on a stay in this part of the world, including day trips to historically and scenically attractive hill towns or seaside towns, and all kinds of activities for the more energetically inclined (including painting, biking and hiking). 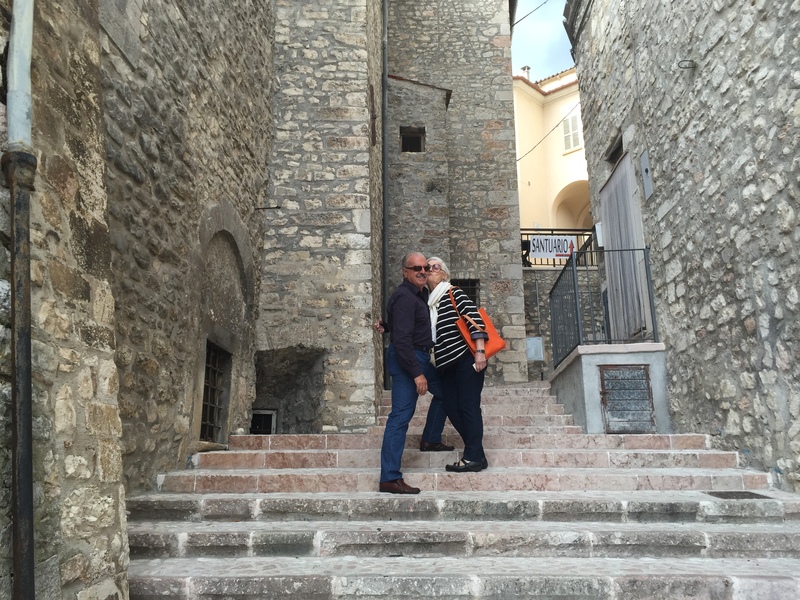 There is so much more to Lazio than meets the eye, and I often say that it is one of the most underrated Regions of Italy. I’m a Lazio Lady, I am, through and through. Anyway, I am in love with the Casale and have very fond memories of a fantastic, 40 people strong, live-band New Year’s Eve party there a couple of years ago, up on the terrace watching all the fireworks over Rome. And during a very hot day last Summer, I did a wine-tasting and cooking class there with a small group who were loath to leave the shady headiness of the arbor. George, who lives permanently at the Casale, is a great cook, by the way. He was making chocolate treats the other day, you know, as one does, just because … I don’t think I could be friends with people who do not appreciate good food, sorry, there I’ve said it. Claire is always on the look-out for interesting places for their guests to enjoy a meal and when she quizzed me the other day, I suggested we go to “Sora Maria and Arcangelo” in Olevano Romano. I had been wanting to go for a while now and this gastronomic jaunt was a perfect excuse for both of us to catch up. The drive there was pretty enough, the autumnal trees beginning to change the colour of their leaves. 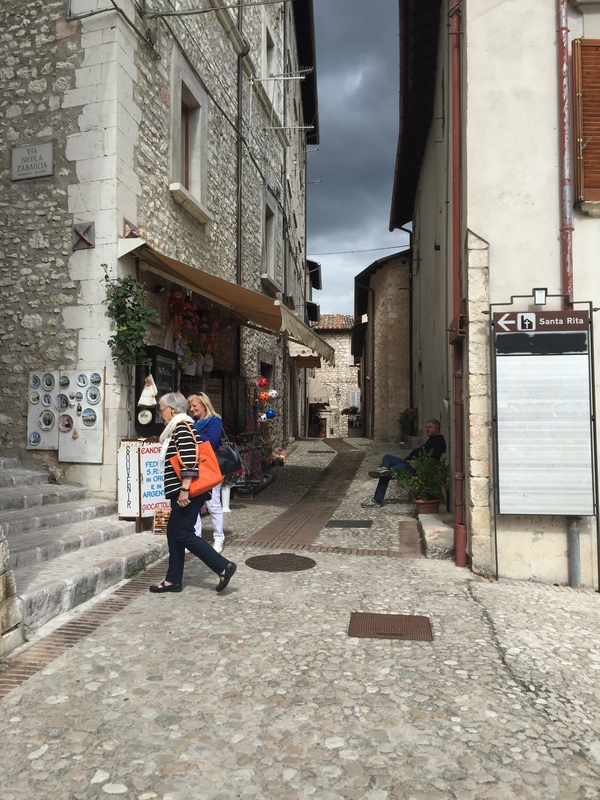 I took the wrong turning at one point, driving past a town called Paliano, and that can happen with me sometimes; I get carried away by conversation and end up on the road less travelled. But get there we did and goodness me! What a great meal. Definitely going to return for more visits with darling husband. By the way, not that it would be any business of the reader, but I do want to make one thing perfectly clear: if I write about people and places, shops and markets, wine bar, tatty trattoria or rolls Royce restaurant, it is because I want to, it is my pleasure – no one pays me for any endorsement. Not that this restaurant needs my endorsement ! 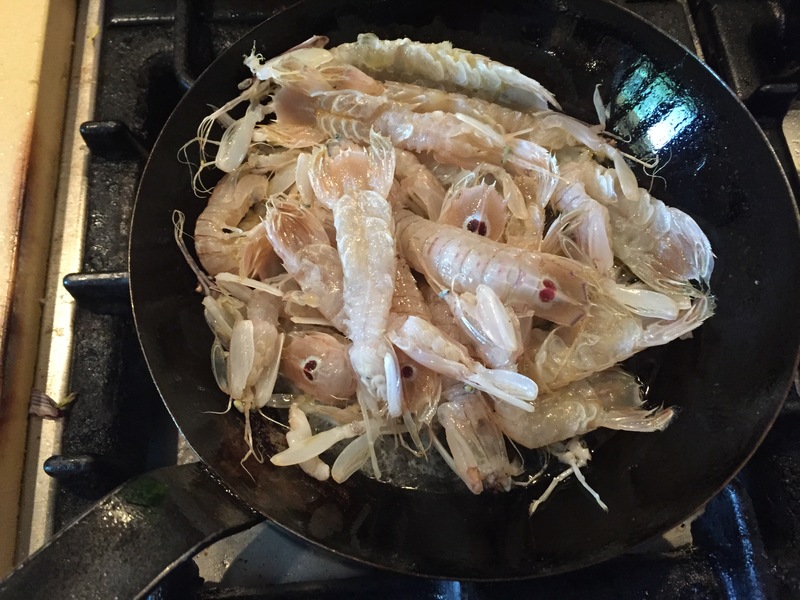 They have been slapped on their backs and feted by the likes of the Michelin Guide and Italy’s Gambero Rosso. Eleonora Baldwin (www.aglioolioepeperoncino.com) and Gina Tringali (www.gtfoodandtravel.com), two of Rome’s top notch food and wine connoisseurs are patrons, I know. And by the way, getting any down-town Roman to budge two kilometers from their blessed city for the suburbs or the nearest countryside is a big thing, let me tell you (they can be such sissies that way, you wouldn’t believe!). There was a truffle based menu … How many of us knew that there were truffles in the Aniene Valley north east of Rome? And jolly nice it was too. Olevano Romano is known for its Cesanese wine as are the towns of Piglio and Affile (hence we have “Cesanese del Piglio” and “Cesanese di Affile”). Sarah May of Antiqua Tours can tell you a bit more about these wines, and the wines of Lazio in the following interview: http://www.the-beehive.com/blog/index.php/italian-wine-for-beginners. It was great to see so many choices and to appreciate the origins of the foods … it was quite obvious that sourcing close by and from the best was a hallmark of this restaurant’s approach to food stuffs. The wine list, instead, reaches out to wines from all over Italy and to France too. Once we had put in our orders. Roberto brought us a little – well, not quite so little – amuse bouche, by way of a rice croquette flavoured the cacio e pepe way; these croquettes are known as ‘supplì’ in Rome. You know me, Fried Food Fanatic … deelicious! To start off with, Claire and I both opted for chickpea (garbanzo) soup with a fried salt cod ‘lolly’. Roberto encouraged us to dip the baccalà lolly into the soup before biting into it, and then finishing off the soup with a spoon, the proper way. 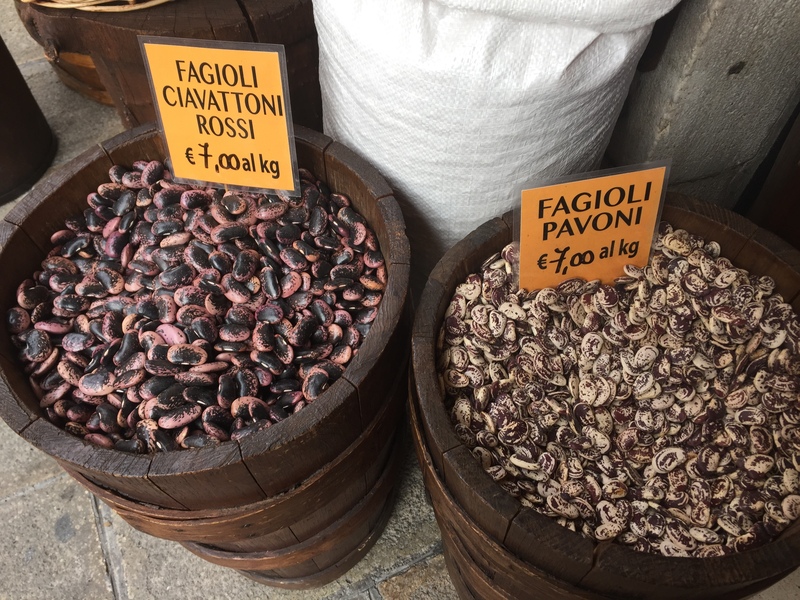 The chickpeas were sourced from Umbria, from the town of Spello. Next for our little tastings was a meatball made from stewed oxtail. 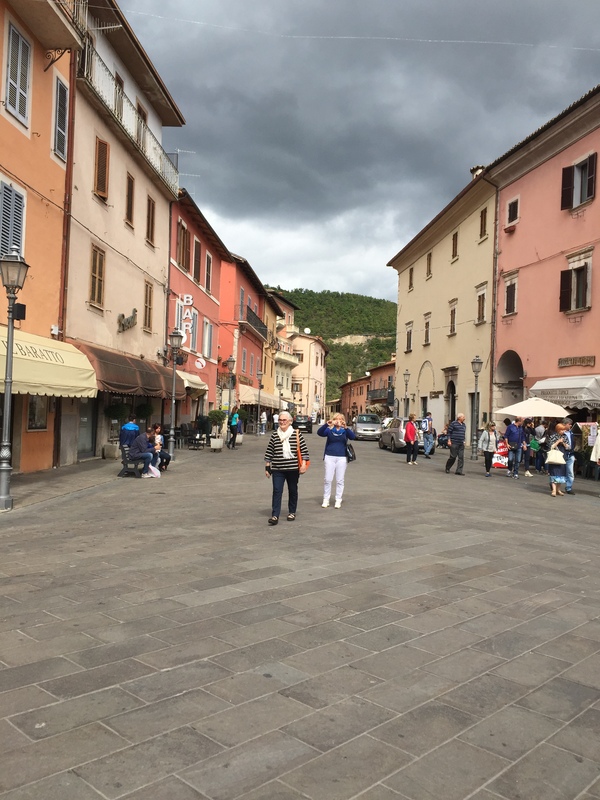 This was a first for Claire but not for me – I had eaten polpette di coda alla vaccinara at the Tordo Matto restaurant in Zagarolo about six years ago. 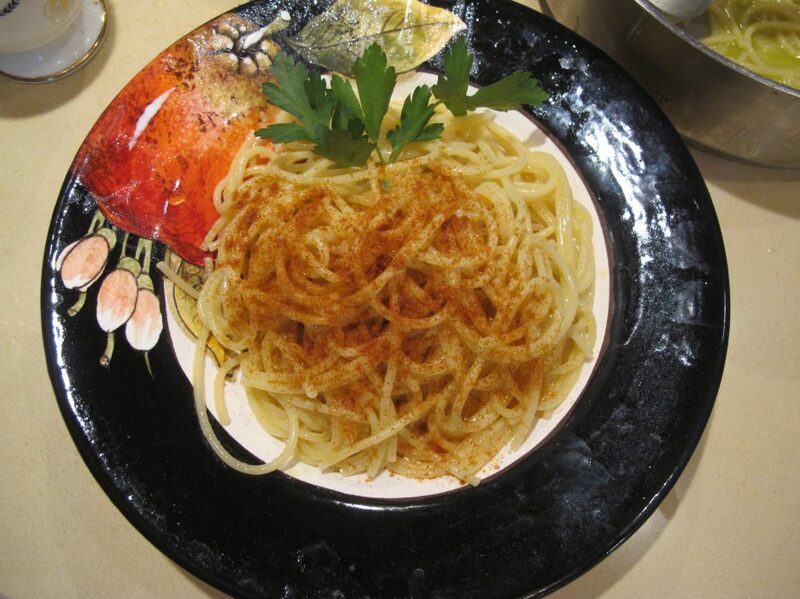 It was one of chef Adriano Baldassarre’s signature dishes. Different in style, so much more tomato sauce chez Sora Maria and Arcangelo’s version, but very very good. For my main course, I went for the lamb trio. Agnello or Abbacchio as it is called in Italy. I had a lamb chop fried in breadcrumbs and lamb roast in the most delicious gravy. The third part of the trio was lamb ‘coratella’ – lamb offal sautéed with onion. This can be a little strong on occasion, but not at the hands of Chef Giovanni Milana. It was truly a miracle that he could get it to be so truly tasty whilst curbing its over-meaty overtones. Hats off, chapeau. A close-up of the roast lamb and rich rosemary infused gravy. Claire went for the faraona roast … the guinea hen stuffed with chestnuts and served with cabbage and potatoes. Please don’t quote me but faraona is not usually something I would hanker after and yet … under Chef Giovanni Milana’s expert hands, this fowl brought the word delectable to mind. Dessert was pannacotta with chestnuts and a persimmon sauce. I don’t even like desserts much but this one has me wanting to imitate it very soon. This is persimmon season after all. Little treats, biscuits, to accompany the coffee. Our waiter, the charming and efficient Roberto. Claire with Chef Giovanni Milana. And there am I, basking between the two, happy as Larry, at the end of such a civilised, gorgeous, leisurely lunch. Good food can put you in the mood, as I like to say … but if there is no atmosphere or if the ambience is unrelaxed or unwelcoming, even the best tasting food has to take a hammering. Grazie Giovanni Milana, grazie Roberto and the rest of the staff at Sora Maria e Arcangelo for bringing such magic to the table. Grazie Claire for a lovely lunch! A friend of mine asked me for this recipe, hence this blog post. It requires 1 kg of frozen asparagus (although of course fresh asparagus would be better), 500ml of chicken stock and 500ml of just plain water. I don’t use stock cubes. There is an Italian salt and herb mixture called Ariosto which is usually brilliant for meat recipes – but a pinch of it comes in handy and adds the famous je-ne-sais quoi to any soup. Also needed are some pepper corns, a few drops of lemon juice, and a swirl of cream. A hint of paprika for toasting the bread with butter and making croutons. 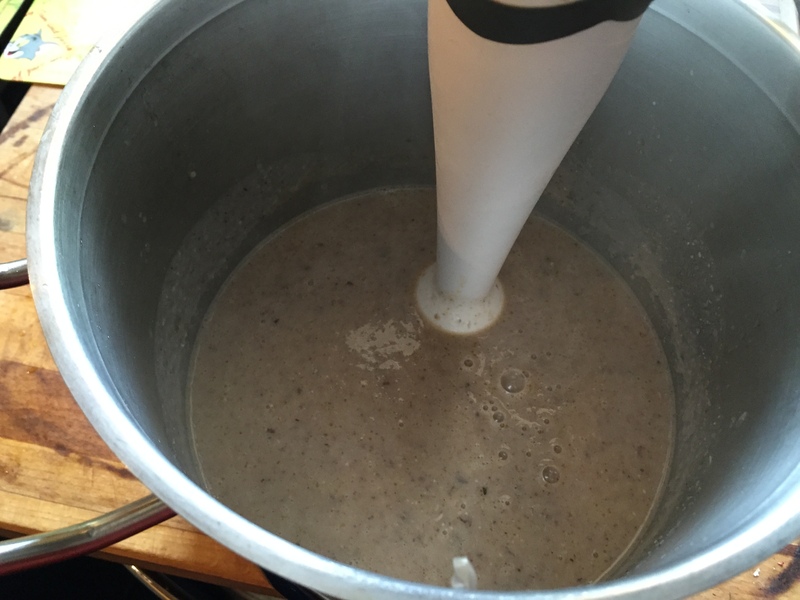 An immersion blender and bob’s your uncle. It is simplicity itself – the photos say it all. Try it, you won’t regret it. 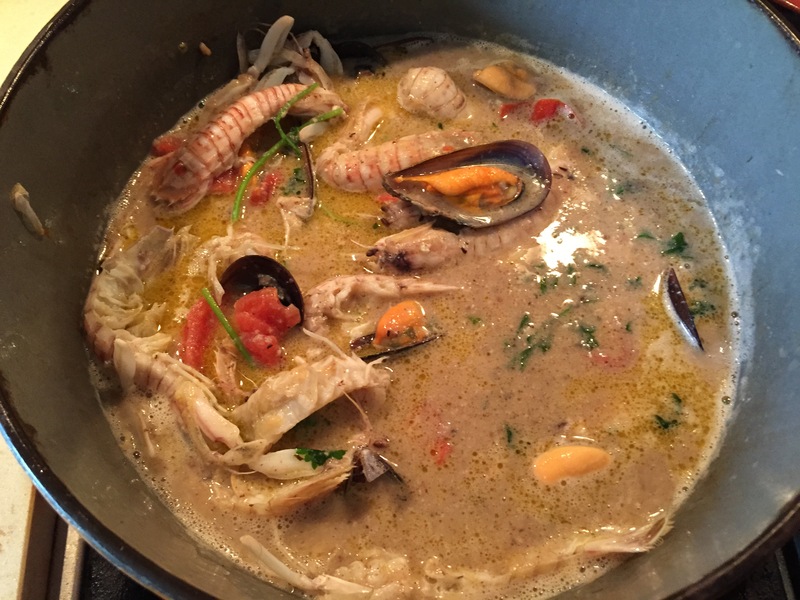 The Saint in question is Saint Rita of Cascia, in Umbria, the stew is a seafood-based one, and the ‘making do’ is the solution to my wondering what to do with some beans I had boiled the day before. Fish and beans are not regular gastronomic dancing partners but in this recipe they tango very well. This is one of those rambling posts so if it’s the recipe you’re after, do by all means go straight to the photos of food and the recipe part further down. This is a recent photo of my mother, in a café on our way to Cascia last month. 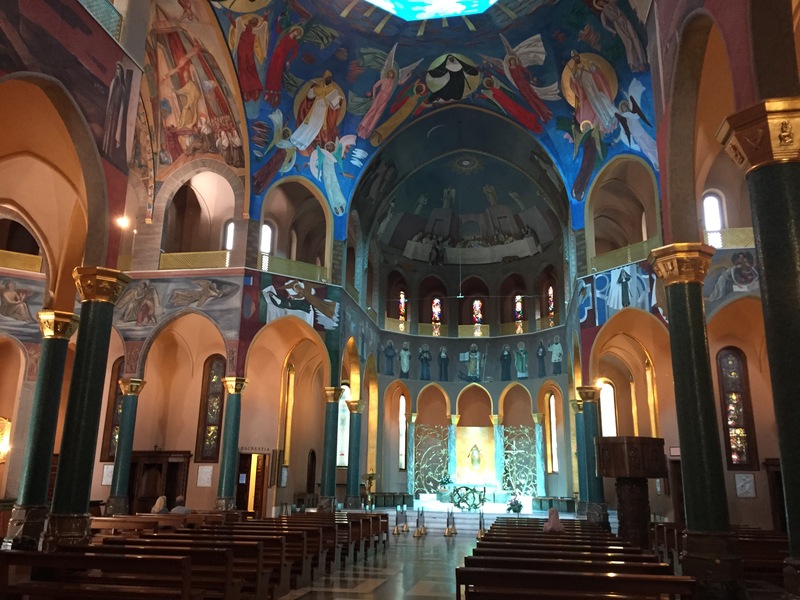 In a post I had written on my other blog in July 2013, I had mentioned the very unusual tale of my mother and one that I am inclined to repeat here, for the trip to Cascia and Santa Rita’s sanctuary there was largely due to her. 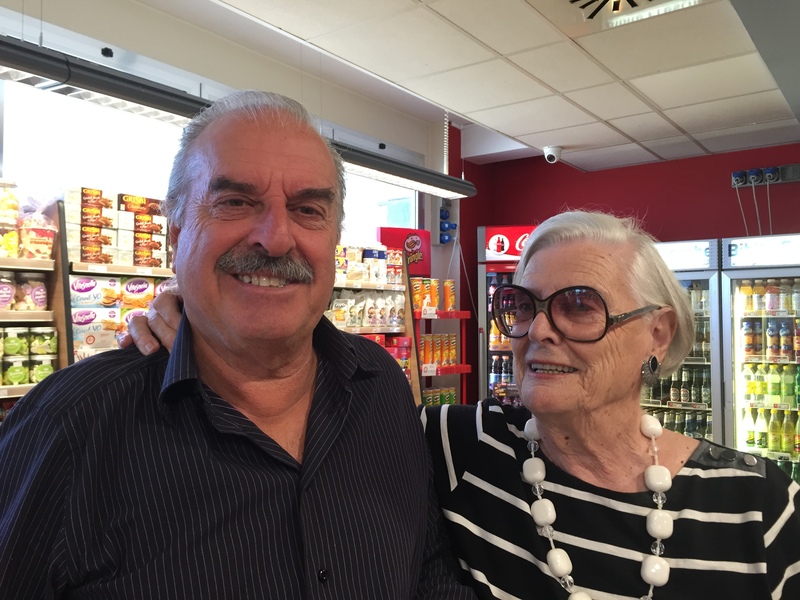 Quote: “My mother is the only Italian I know of who travelled to Sweden in order to learn English. That was back in 1950 and it was no mean feat for a 24 year-old unmarried woman to travel on her own all the way from Rome to Stockholm. The route went something like this: Rome-Florence-Milan-Paris-Berlin-Copenhagen by train, and, after taking the boat and once in Sweden, yet another train to Stockholm. She ended up marrying my father, having me, becoming my father’s widow and,when I was five years old, re-marrying, to a Scotsman this time — who was living in Chittagong, East Pakistan, while they were courting, and who moved to Karachi, West Pakistan, when they got married in 1961. My stepfather’s job also brought the family to Iran, Bangladesh, the Lebanon and Cyprus and back to Pakistan. A lot of relocating, some of which was due to local political turmoil. 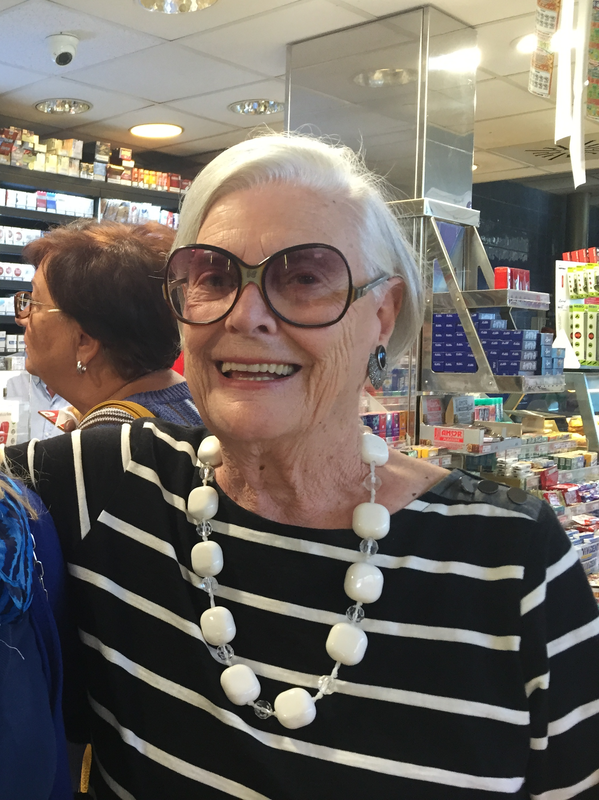 My mother, whose name is Agnese by the way, and who is now pushing 89, has had a very interesting life but, as with many an interesting life, it was not without complication and tragedy even. All this to say that she is a tough old bird, with a fiery spark in her beautiful eyes and outlook, a person who can always hold her own. We all love her Italianissimo accent, the kind of Italian accent that often got its leg pulled in old Hollywood movies, and she has that Italian ‘flair’ and outspokenness that used to ruffle expat English memsahibs back in the days when the The British Women’s Institute (in Karachi, if you must know) really didn’t know what to make of her simply because she WAS Italian. Her opening line, very often, saw her embroiled in an intellectual throwing-the-gauntlet discussion ushered in by the phrase, “You can say what you want, but …” — and this when nobody else had even had a chance to form an opinion, one way or the other. “He is notta normal” was another staple summoning up of a person’s character. She has had a lot of patience with people who were notta normal in her life. The one phrase that has stuck out as being THE most Agnese-defining, however, is the coy, “Do you vant me to be diplomatic or sinceeer?”. Many an unwary bystander has fallen prey to this apparently innocent question, and we who have witnessed her employ this stock phrase like a snake charmer’s flute are only too aware that it doesn’t really matter what a person would prefer (i.e. her being tactful or upfront) — she is going to tell it as it is, and that’s that.” End of Quote but not end of my mother’s outspokenness and quirky logic. This is a photo of Mamma with her baby brother Antonio, nickname Toto. He and his wife Pina also came along to Cascia. She regards discussions about philosophy and life very seriously and in recent years has taken recourse to an adage that helps her deliver a trump card in any mentoring discussion, and that is: “You can attempt to elude Destiny as much as you like but, in the end it will wake up before you in the morning “ . Ta daaa. And you, dear reader, can imagine how disempowering such an attitude can be for any of us when attempting to present another point of view. Though respectful of other people’s faiths and credences, she is of strong atheist conviction, quite scathing about catholic priests and popery, and is not above telling people off for believing in the nonsense of certain rituals of the Christian faith — and yet, and yet, she thought it quite logical that she and I could do worse than to make a pilgrimage to the sanctuary of Our Lady of Divino Amore just outside Rome on the Via Ardeatina. 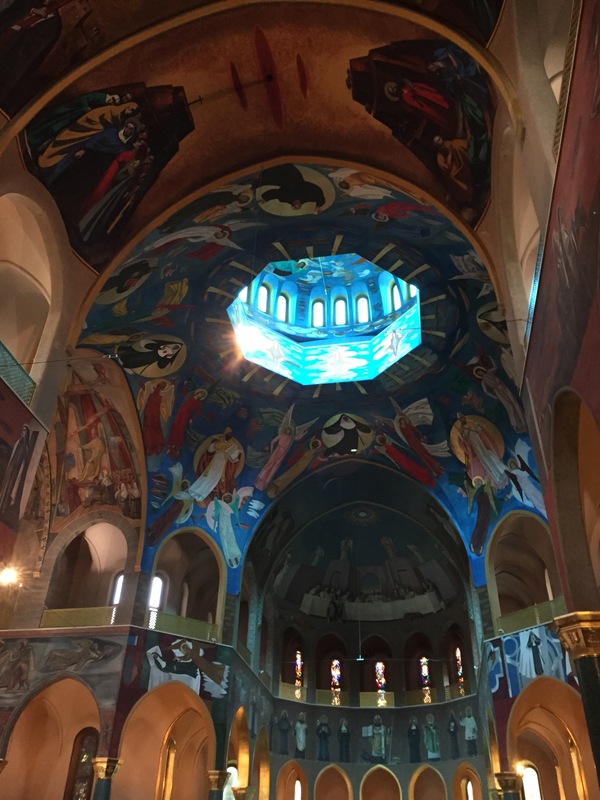 “I can’t pray for myself, of course, but I can pray for you and your sisters,” was the syllogistic conclusion to her inductive thinking process when I put it to her that praying and atheism were somehow at odds. She told me all about how a visit to the sanctuary way back when in the 1960s had resulted in my stepfather finding a good job again. If it worked then, why shouldn’t it work now? So off we went, it’s not very far from where we live, did our little pilgrimage and then enjoyed a nice lunch together. “We should do this more often, Mamma” I said to her with good cheer. “We should make it a point of visiting sanctuaries once a month and that’ll be an excuse to do something together.” Despite living three kilometers from one another, life has become so complicated and busy these past few years that sometimes many days go by before we manage to see each other, sigh. I know I am not the only one in this time-constrained pickle … so many people I know are hampered by the lack of leisure time. There is my mother, with the orange bag. That’s my aunt Pina with my mother, as we made our way to the top of Cascia, to the sanctuary. Just look at her posture will you! Brother and sister on the stairs. Anyway, nothing loath, we arranged to go and visit Cascia, inviting her brother and his wife to come with us for the day. Cascia is home to Saint Rita and she used to be my mother’s favorite saint back in the days when she believed in the power of saints. Saint Rita is known for helping out on lost causes and is associated with bees and roses. I liked that. The drive there took as through beautiful countryside and past the waterfalls of Le Marmore, with farmers selling great potatoes and onions by the wayside. After lunch in a very friendly trattoria, we wandered around the town and in and out of a few shops, especially food shops. I admired the local saffron but bought beans instead. And that … is how we get to today’s recipe. 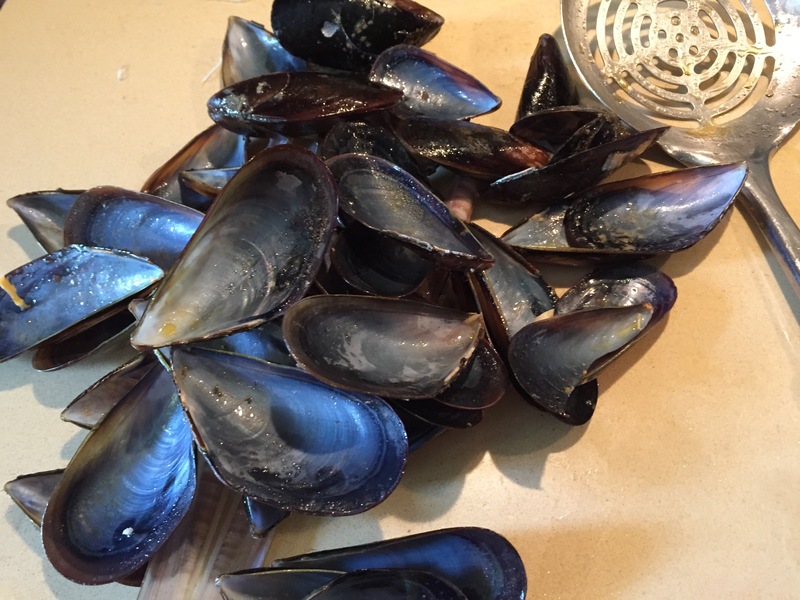 And, at a good fishmonger’s in Monteporzio Catone (not far from Frascati), I had bought some mussels and razor clams. I put them into a casserole, added a few cherry tomtoes, a few cloves of garlic, a splash of wine, and steamed them open. I also bought these prickly things called ‘canocchie’ (Squilla mantis is their Latin name) – https://en.wikipedia.org/wiki/Squilla_mantis. I simply cooked them through with some olive oil. 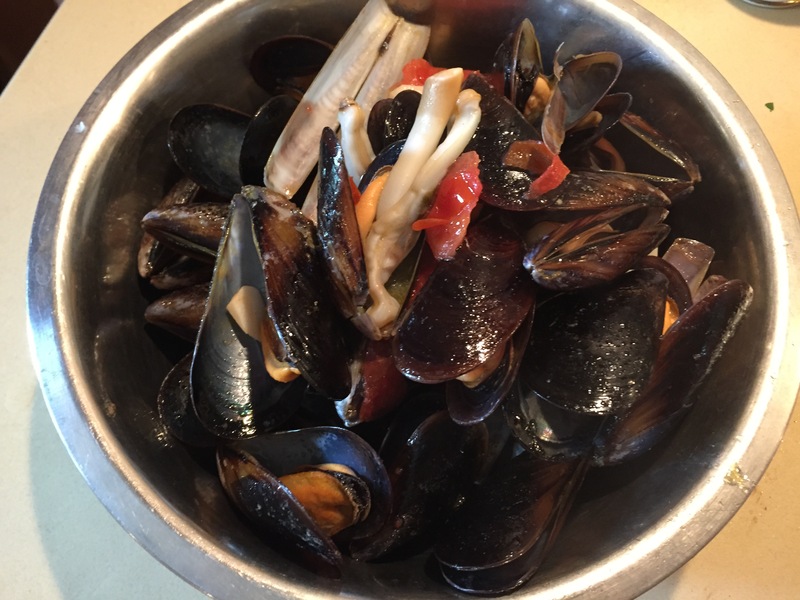 I then removed the mussels and razor clams and tomatoes from the casserole. And this liquor is what was left. Mmmmm. This is the most delicious part! 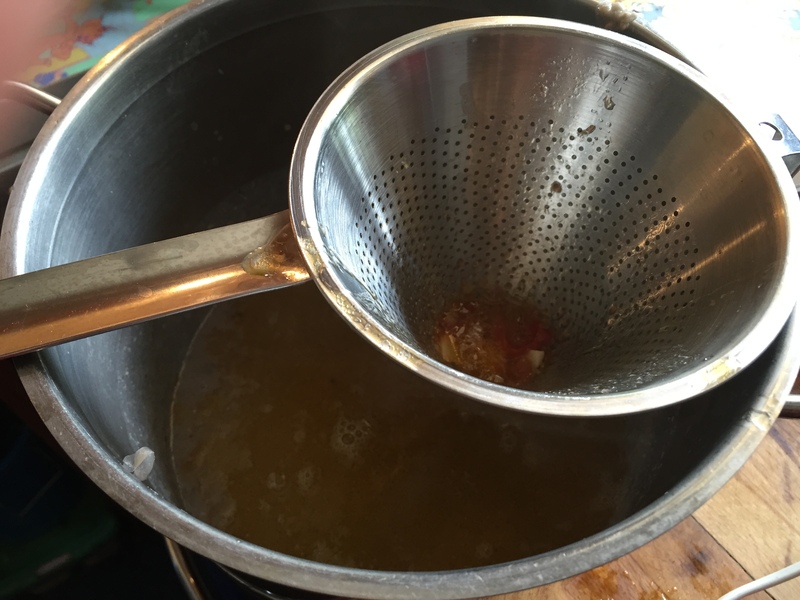 I strained the fish stock through a colander into another saucpean. 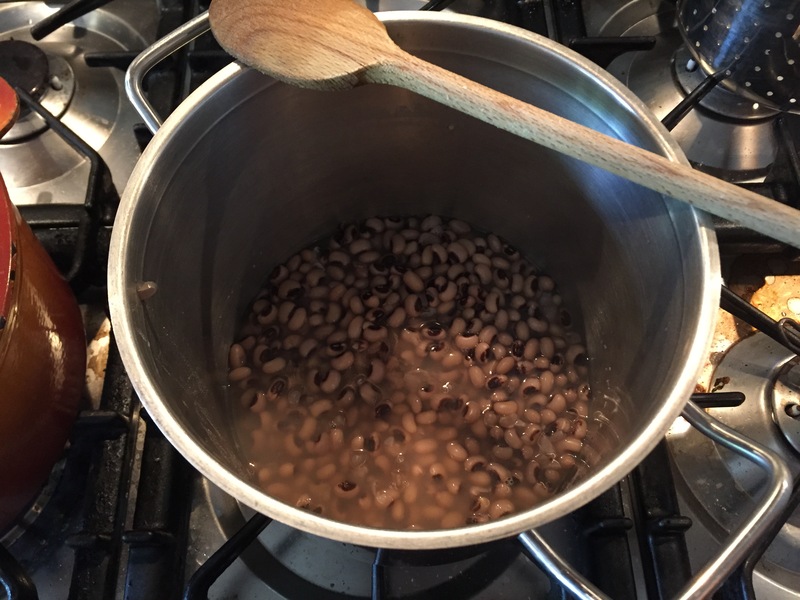 And there were the beans, ready in waiting … I poured the fish stock into the beans, and used an immersion blender to process the beans with the fish stock. 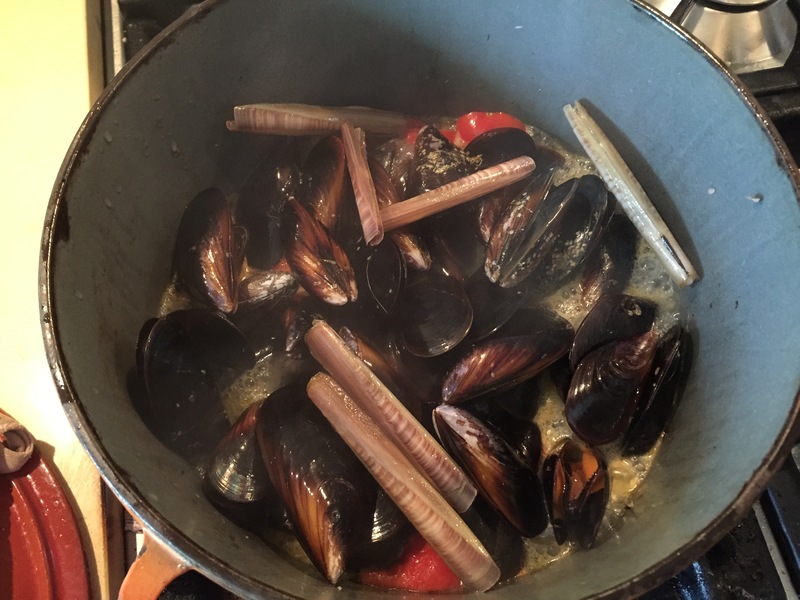 I got rid of most of the mussel shells … And I then put the mussels on the half-shell BACK into the puréed beans, together with the tomato fillets. I now added the canocchie, and some parsely stems. Used a wooden spoon to combine everything, added a twist of pepper … and … Bob’s your uncle. This fish and bean stew was rocking, let me tell you ! 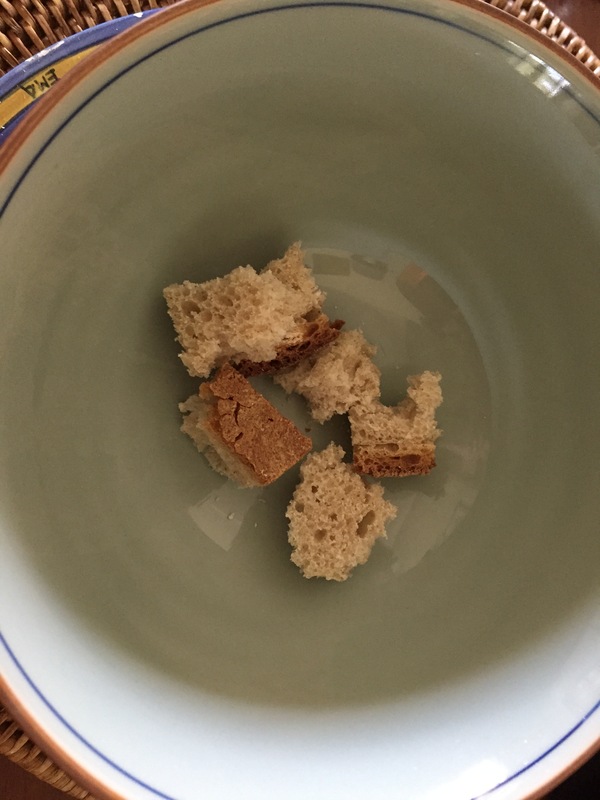 One final touch: toast some bread and then add it to the soup bowl. 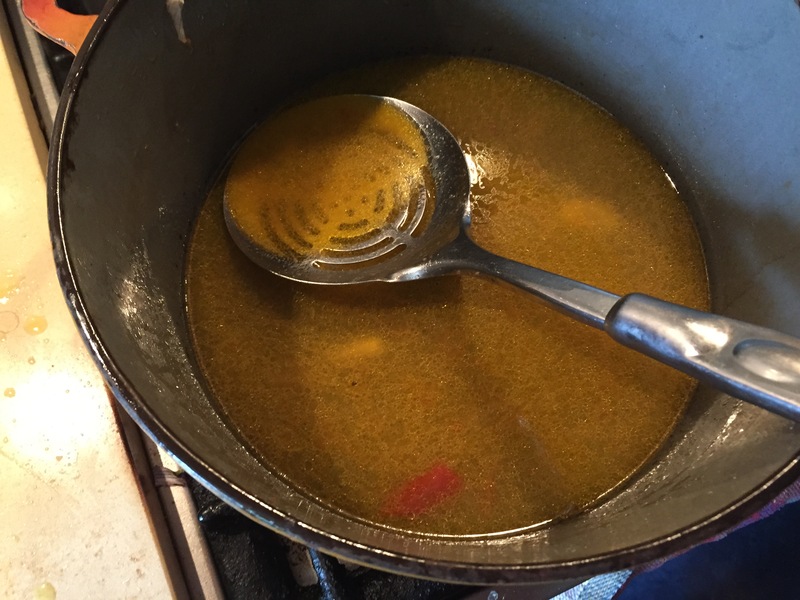 Pour the fish-stock bean soup into the bowl. 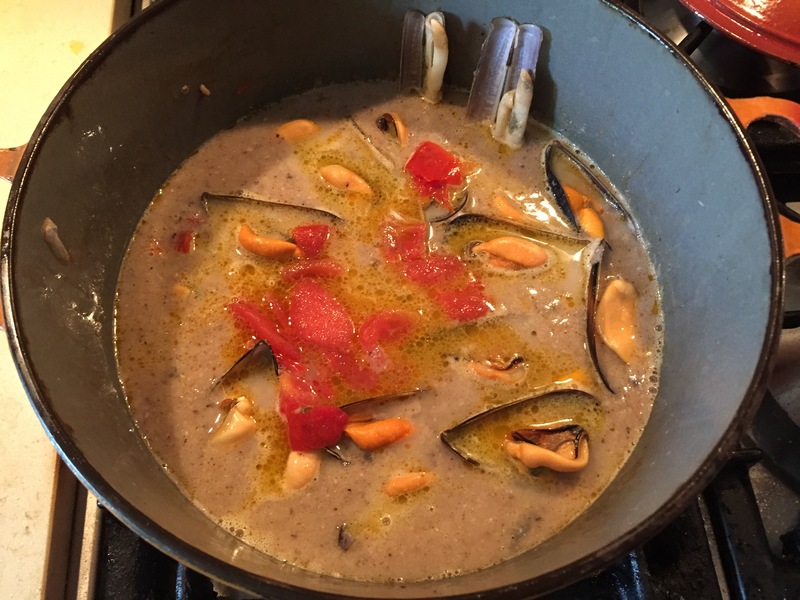 Add the mussels and the canocchie. 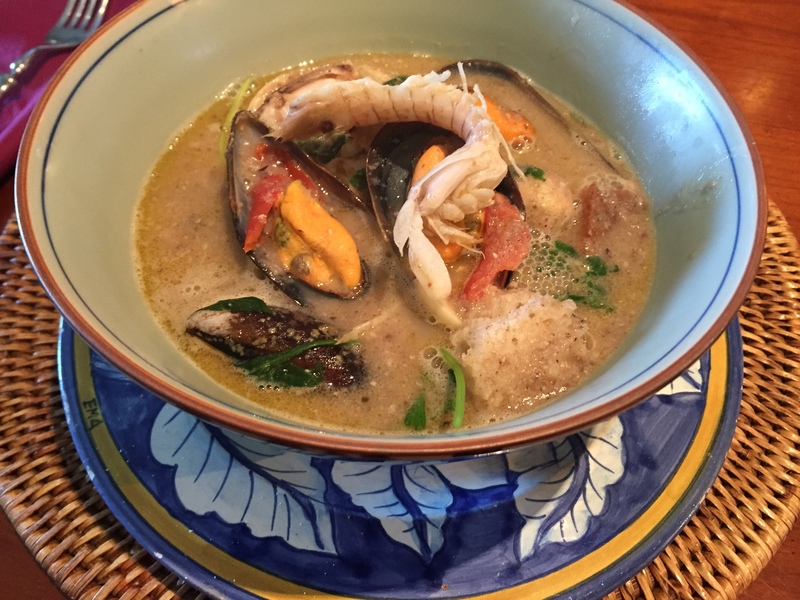 And enjoy the understated voluptiousness of beans, seafood stock, mussels, canocchie, tomatoes, parsely stems with a hint of chilli and a swirl of olive oil at the very end.